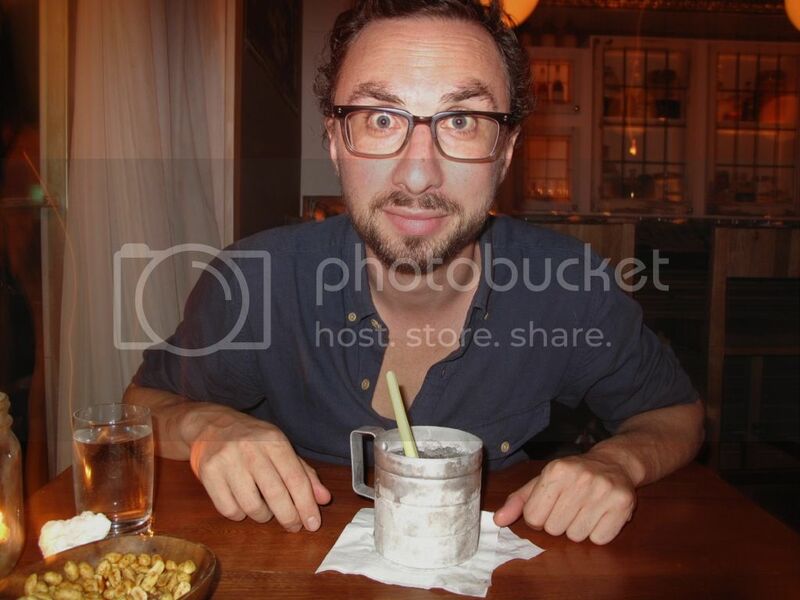 My drink with Dan perfectly exemplifies why I chose to do this blog. We met a couple of Superbowls ago. I can’t even remember what season that was let alone month, that’s how much I know about football. But at this particular Super Bowl party, no one watched the game anyway, we were more interested in the half time show. What struck me about Dan was his exuberance toward the Black Eyed Peas performance which generally got trashed the next morning. He was just impressed by the scope of it. He was being positive. We became what I like to call “party friends” and I even sang on his band’s album with my choir (the one I’m no longer in, See Drink #2) but I had never really gotten to know him. He suggested going to The Black Hoof Cocktail Bar. These people take their meat seriously. I haven’t eaten meat since New Year’s Day (I will likely explore that more in another post). While I gorged on peanuts and he enjoyed something much more appealing in smell and presentation, we really chatted up a storm for several hours. He told me how his parents first met when they were fourteen in a hotel in South Africa. I told him how I missed my cousin’s Majorca wedding where Carla Bruni was a guest to attend my high school graduation. Dan is a good story teller and I did my best to keep up, except when it came to talking about his work. To plagiarize from his web bio, “Daniel Werb has worked extensively in the fields of HIV/AIDS, addictions, and the impact of drug policies on vulnerable populations as a researcher at the BC Centre for Excellence in HIV/AIDS and co-founder of the International Centre for Science in Drug Policy.” Yeah. This is when I shut up and listened while he became very passionate about the war on drugs then apologized for yelling. It’s the kind of thing that really puts the stresses of my TV job in perspective which is an extremely important thing for me to do. Thank you Dan.